Earn $34.79 in Rewards credit. Click to learn more. When you're out on a gravel epic, you've got to be loose and relaxed without losing focus. With the FSA SL-K Modular Adventure BB386 EVO Crankset's super compact chainrings you'll be able to keep your cadence up, and when you get a new frame with a different bottom bracket this modular crankset will be ready to make the switch thanks to its adaptable 30mm spindle. The SL-K Modular Adventure crankset is purpose-built to deliver you quickly and efficiently to the top of the steepest gravel or dirt climbs, featuring two different super compact chainring combinations: 48/32 or 46/30. Lightweight Hollow Carbon crank arms help keep the weight low without sacrificing stiffness or durability. The real standout feature of this crankset is the adaptable BB386 EVO spindle, designed to fit a wide variety of frames and all major BB standards. BB386 EVO Spindle fits all major BB standards. Direct mount outer chainring, 90 BCD inner chainring. Fits Shimano and SRAM 10- and 11-speed drivetrains. Super Compact gearing: 48/32 or 46/30. 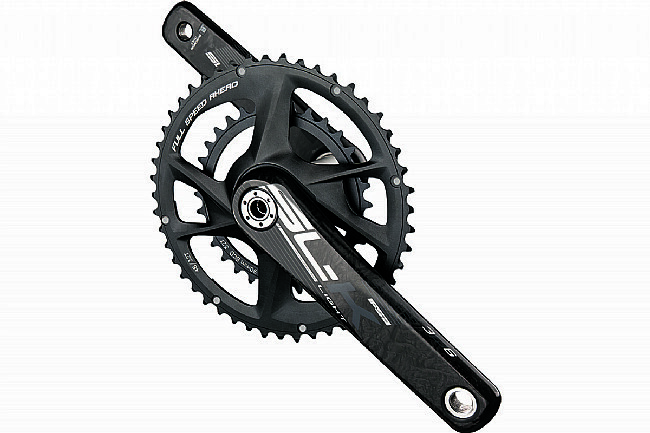 The FSA SL-K crankset is light weight and one of the few that can mount a 3046T chain ring combination. 17 of 18 customers found this review helpful. I installed the SL-K Modular BB386EVO crankset with 3046T rings on my rando bike's BB30 bottom bracket using FSA adaptors. My objective was to replace the standard 3450T alloy crankset to take advantage of the improved range of gear ratios. The front derailleur could accommodate the 16T difference and only required it to be lowered to properly align with these smaller chainrings. This was a very simple swap. I shortened the chain and was back on the road. The new gear ratios have made for more pleasure long distance rides that include any significant climbing. I have subsequently installed this same product on my CXgravel bike by using FSA bearings made to accommodate the BB386EVO spindles in the BSA bottom bracket. This set up has also greatly enhanced my dirt adventures.